Search results for "Facades+ AM"
Religious believers from local communities conceived the idea for this ambitious project in Bern, Switzerland, well over a decade ago. As a result of their vision for creating an interreligious space, Europan5 launched an architectural competition in 1999, which was won by Madir Shah of Urbanoffice in Amsterdam. The competition marked the start of a fifteen-year-long process of realization. 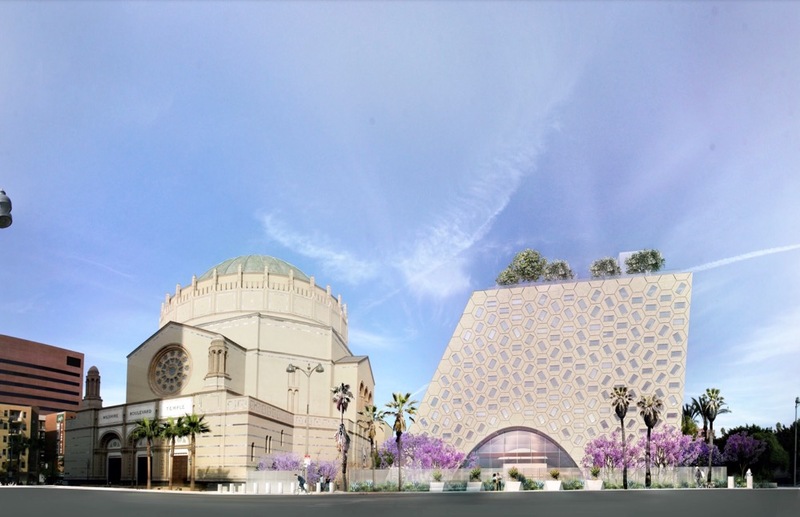 The core idea for this project was the creation of a place that would accommodate sacred spaces for five world religions under one roof. A unique place of worship that facilitates the meeting of people from different cultures, nationalities, and religious groups in one place. Dark gray Swisspearl Texial panels with two different embossed surface textures were used as the primary cladding material; this was well chosen as it is neutral and restrained, allowing the reflective, glazed section housing the religious spaces to be more prominent. Furthermore, as the fiber cement panels allow a great deal of flexibility, it gave the architects the freedom to configure the fenestration in different ways and to denote the various stacked functions. 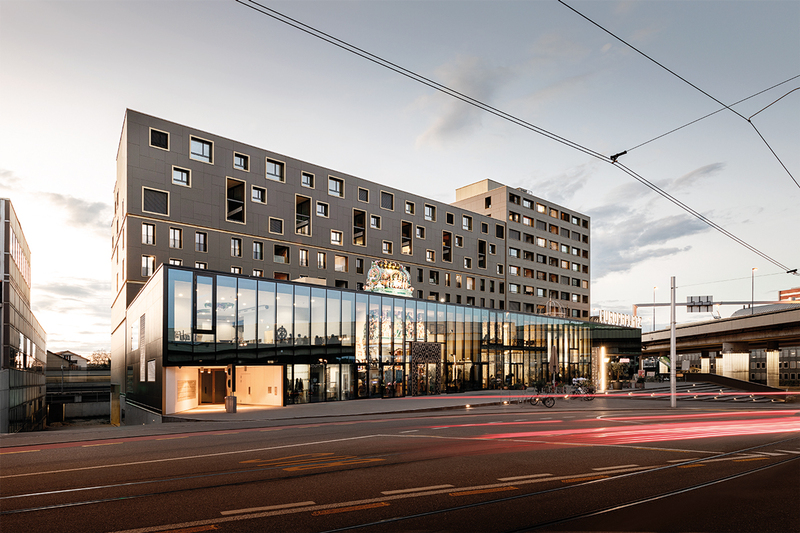 Read more about our new Swisspearl Texial facade panel on our blog “A Swiss pearl for the world." The Forge Prize recognizes innovation in the use of steel. Established by the American Institute of Steel Construction (AISC), the prize invites designers to submit proposals for visionary designs that embrace steel as the primary structural component. Organized by the Association of Collegiate Schools of Architecture (ACSA), it is intended to engage designers in developing imaginative designs that bolster steel as the 21st-century building material of choice through a two-stage design challenge, culminating with a public announcement event of winners in summer 2019. Projects can focus on Architecturally Exposed Structural Steel (AESS), Modular Construction, Long-Span, Reuse, Systems, Urban Density, etc., but are not limited in their scope or complexity. 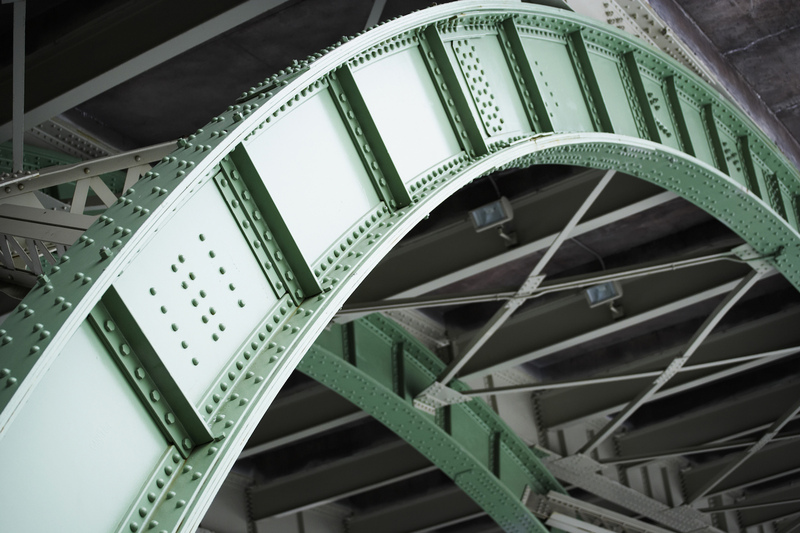 The Forge Prize is open to all innovative uses of structural steel. Get inspired! Grand Prize The grand prize winner will receive $20,000. Eligibility The Forge Prize is open to designers practicing in the U.S. or Canada. Entries will be accepted from individuals as well as teams. Team submissions are required to have a designated Team Lead. Individuals or the Team Lead should be an emerging professional, in the process of licensure or within 10-years of licensure. For full details and to submit visit www.forgeprize.com. In 2011, Buenos Aires-based estudio Claudio Vekstein_Opera Publica (eCV) was approached by the government of Argentina's Sante Fe Province to design a space memorializing the centennial of the Alcorta Farmers Revolt. Founded in 1892, Alcorta is a small farming town laid out according to a dense and rigid grid surrounded by plotted agricultural land, an urban morphology typical of this southern corner of the province. From this historical context, eCV's Memorial Space and Monument of the Alcorta Farmers Revolt rises as an asymmetrical fissured edifice wrapped with semi-translucent, prefabricated epoxy resin-and-fiberglass panels. The complex, located on an approximately 81,000 square-foot plot, is a visual homage to the town and region’s proud pastoral heritage. For the main northwestern facade, eCV Principal Claudio Vekstein turned to the region’s traditional forms; during the harvest season, farmers would pile their corn bags into hillock-scale mounds as a testament of collective pride in their work. Approaching the memorial from the southern border of the town, Vekstein achieves a material and symbolic bridge to the past with a vast canvas of an “insistent, alternating and syncopated relief of bags” formed out of epoxy resin, fiberglass, and rough burlap cloth. For the relief of the bags, eCV designed a set of rectangular molds of a standard height and varying widths. These modules are plugged into 275 alternating facade elements measuring approximately 3.5 feet in height and 7 feet in width. The billowing mass of the reinforced resin panels is broken by a series of narrow apertures of four different dimensions. The structure of the monument is highly visible, consisting of exposed and inclined steel beams and trusses planted into a concrete foundation. Mounting the precast facade panels onto the structure was a fairly straightforward operation: the panels are attached to a bracket-connected metal framing system with self-tapping screws. In total, the installation of the panels took approximately three weeks. A significant portion of the northwestern facade folds over the 4,300 square-foot built area and interior segments of the panels are backed by rows of grooved fiberglass. The rear elevations, which host offices of the Agrarian Federation and communal spaces, are fronted by rectangular corrugated sheets of metal that are similarly fastened to a framing system. During the day, the semi-translucent screen filters a soft yellow light into the memorial's principal spaces. The rough burlap fabric, which provides the panels their outward dark hue, takes on the form of a glowing and sinuous skin. As the sun sets and interior spaces are illuminated by artificial lighting, the facade becomes a lamp beaming toward Alcorta. Beyond the facade, eCV’s interior is spartan and reflective of the populist ethos of the overall design typology–the flooring is bare concrete, with steel trusses and cross braces cascading below the slanted roofline. After six years of episodic construction, the complex opened to the public on the 106th anniversary of the uprising in June 2018. 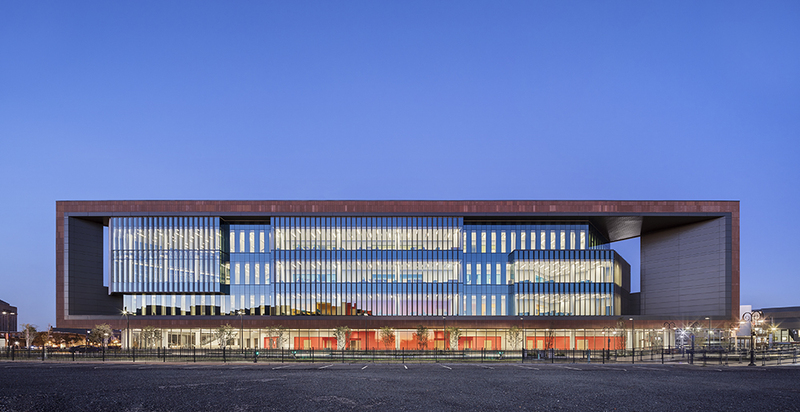 Completed in November 2017, the Perkins Eastman–designed School of Nursing and Science Building occupies a former parking lot in downtown Camden, establishing a new institutional heart for Rutgers University in the slowly reviving city. The design inhabits a formidable full-block mass, reaching a height of four stories with a multidimensional facade of high-performance concrete and glass curtainwall shaded by perforated panels. Similar to other urban centers across the Rust Belt, Camden has undergone a significant period of economic stagnation and demographic decline since the mid-20th century. However, the continued expansion of healthcare institutions, such as the Nursing and Science Building, is fundamentally reshaping the city’s character. 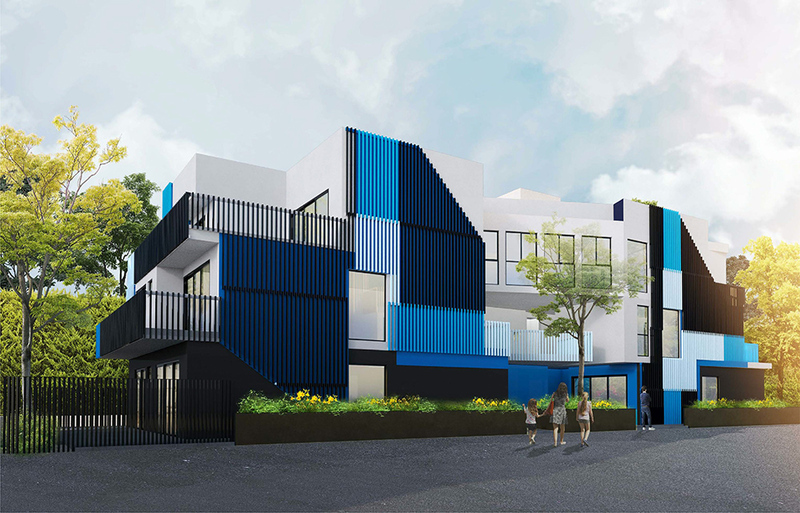 The project is located on a triangular site adjacent to Camden City Hall, and the residential neighborhood of Lanning Square. Owing to the irregularity of the site, each elevation of the 101,000-square-foot project is a different length. Rather than attempting to establish conformity across the Nursing and Science Building, Perkins Eastman’s design plays with each facade's unique dimensions. The southwest elevation features a hollowed-out frame filled by a three-story glass facade, while the northeast elevation recalls the more traditional masonry punched window style found around the area. For the rainscreen, Perkins Eastman turned to TAKTL, a design and manufacturing operation located in the Greater Pittsburgh Region, to produce rectangular high-performance concrete panels. To blend in with the prevailing use of stone ashlar and brick for historic buildings in downtown Camden, the concrete panels are colored reddish-brown and finished to resemble non-glazed terra-cotta. The panels, measuring one-by-three feet, are face-fastened with color-matched screws to the light-gauge structural steel stud framing. While the rainscreen serves as an oversized framing device, the bulk of the 110,000-square-foot project resides behind glass curtain wall. Sections of the curtain wall bulge from the assembly, providing room for a variety of functions within. “The facade is composed of two distinctive wall types,” said James Butterfield, RA, design Principal at Perkins Eastman. “One which employs a full-height, vertical perforated metal shading system, and a second which introduces opacified shadowbox panels to minimize the quantity of unshaded vision glass.” Each curtainwall module reaches a height of 30 feet and is anchored at the end of each concrete slab. Aluminum brackets project from the Kawneer-produced wall system and are fastened to the 1/4-inch-thick vertical perforated panels at four points. The overall goal of these devices is the mitigation of solar incidence and internal glare associated with typical large-scale curtain wall design. 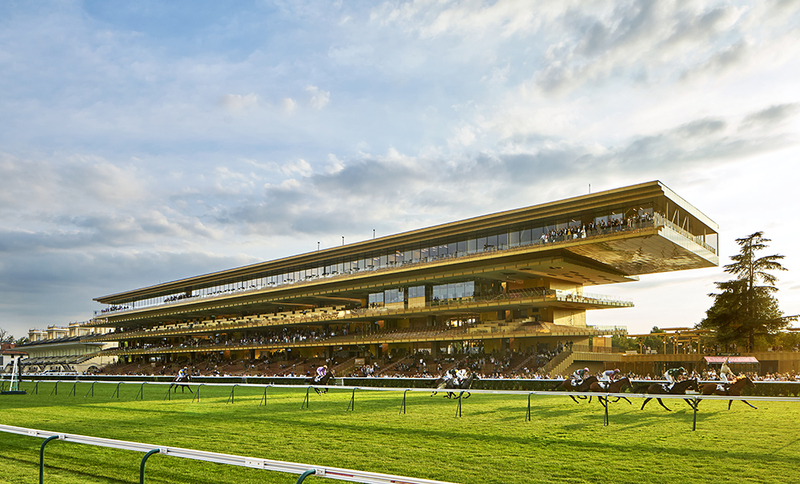 In 2011, Dominique Perrault Architecture (DPA) was chosen by France Galop, the governing body of horse racing in France, to redesign and modernize Paris’s venerable Longchamp Racecourse. Located in the city’s second largest park, Bois de Boulogne, the design of the 160,000-square-foot project seeks to connect to the surrounding landscape—the racecourse’s most prestigious events occur during the fall—with a luminous gold-yellow aluminum and steel facade. Construction of the project was completed in January 2018. Opened to the public in 1857 as part of Haussmann’s civic improvement schemes, the Longchamp Racecourse has undergone significant transformations over the course of its century-and-a-half existence, including the destruction of two historic grandstands in favor of mid-century concrete pavilions that dwarfed their surroundings. DPA's update stripped away these bare concrete additions, built a new 10,000-person capacity grandstand, and restored surrounding historic structures, with the goal of boosting year-round use of the facility and its overall cohesion with the surrounding city. The new 525-foot-long grandstand has a polished golden hue, which contrasts with the bright white coloring of adjacent historic structures. Aluminum and steel in a variety of treatments and configurations clad a steel and concrete structural system. For the curtain wall, DPA opted for sliding, 10-foot tall stainless steel mesh panels stretched within a frame by a simple pin and rod mechanism. Produced by metal fabrics manufacturer GKD and framed by LCD Pose, the operable panels are a subtle kinetic element that facilitates natural ventilation and light filtration. 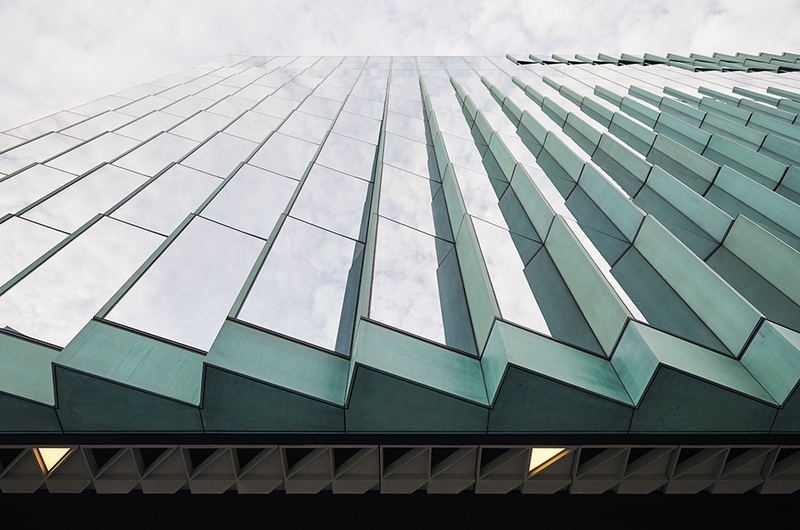 An aluminum rainscreen, produced and installed by Bysteel, courses across the complex in flat rectangular panels to create a protruding chevron frieze. Below the cantilevered top balcony, the iridescent cladding serves as a semi-reflective soffit that distorts the scene below. Glass panels, measuring approximately six feet in width and four feet in height, line the grandstand as a semi-translucent balustrade. To ensure visibility of the racetrack for the audience, glass manufacturer and glaze specialist Saint Gobain provided low-iron SGG Diamant panels, facilitating greater light transmittance and minimal green tint. The panels were screen printed with pixelated patterns evoking foliage across the facade. The massing of the grandstand is meant to represent the motion of a galloping horse: the top floor dramatically cantilevers 65 feet over a steel-and-concrete console and inclines toward the adjacent racecourse. With open-ended terraces—referred to as "transparent shelves" by DPA—and a design that faces outward, the crowd is afforded vistas of the stables below and the city beyond. Imagine a world where artificial intelligence tracks your every movement. A world where buildings have minds of their own, learning your behaviors, and collecting data from you as you come and go. While existing technology has not yet reached sci-fi levels, a visit to an Amazon Go grocery store can offer you a peek into this possible future of retail design. This week Amazon announced its plans to open a new store in New York, the first of its kind on the East Coast, before opening nearly 3,000 more nationwide by 2021. The company has already built out six Amazon Go stores in Seattle, Chicago, and San Francisco. The cutting-edge stores, as shown within its first locations, are characterized by visual simplicity, clarity, and hyper-functionality. Through the stores' structural elements, including minimalistic facades, geometric configurations, and exposed raw materials, such as wood veneer and polished concrete, the interiors assume an industrial feel. They feature muted colors and black merchandise racks that give the stores a clean appearance as well. Meanwhile, ceiling cameras monitor shoppers as they wander through the aisles. The stores are unique in that they are void of cashiers, cash registers, and self-service checkout stands. Customers only need to walk in, take what they need, and leave. As they swing through the turnstiles on their way out, Amazon automatically bills their credit cards. Within minutes, a receipt is sent to the Amazon app, giving customers a summary of what they bought, what they paid, and the exact amount of time they spent in the store. The stores, which depend on highly sophisticated image recognition software and artificial intelligence to function, are expected to drastically transform the retail experience in unexpected ways. Amazon began working on retail stores five years ago with the goal of eliminating consumer criticisms and complaints, such as struggling to find products and waiting in long lines. 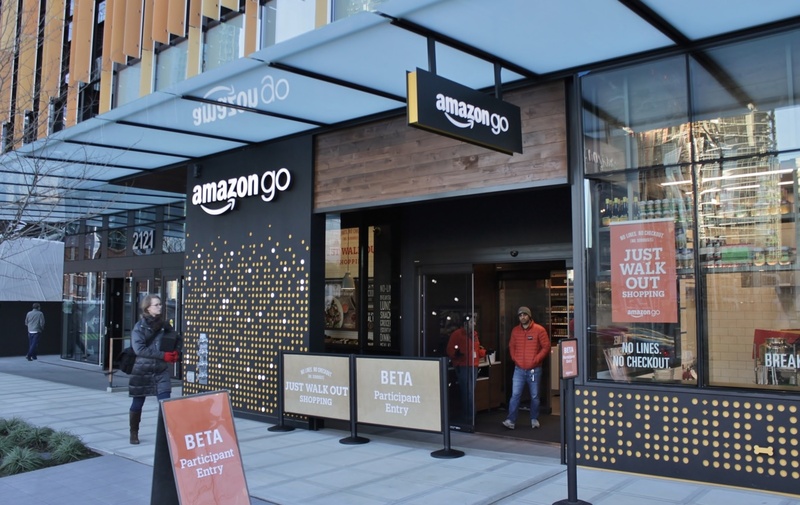 Since the first Amazon Go store opened last January in Seattle, it has received tremendous praise and success. According to CNN, highly automated retail stores like Amazon Go are expected to become the norm within as little as 10 to 15 years. Research has shown that up to 7.5 million retail jobs are at risk of automation in the next decade, which will save retailers money on labor, as well as boost profits, but obviously cost retail workers their livelihood. Automated stores can facilitate the ordering and restocking process as cameras and AI track inventory in real-time. The removal of cash registers provides more space for inventory. Customer data can also be uploaded to the servers of each building, where retailers can present them with personalized discounts, offers, and other incentives. While Amazon has confirmed plans to open an Amazon Go store in New York, its location has yet to be determined. Since the construction of the High Line’s first section in 2009, Manhattan’s Meatpacking District has undergone a dramatic transformation from a declining industrial district to a burgeoning site of development attracting leading national and international firms. Now, California’s Backen & Gillam Architects has stamped its presence in the neighborhood with a modern aluminum-and-glass screen wall inserted atop a restored historic reddish-brown brick warehouse. 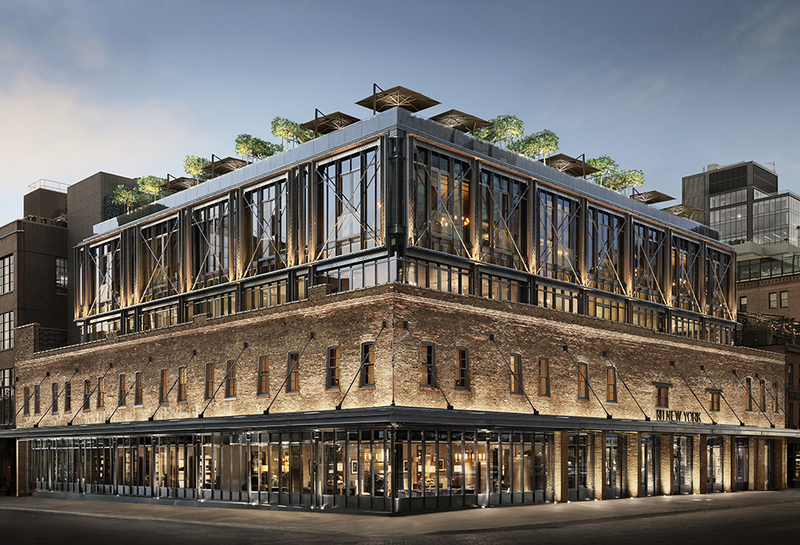 Located on the corner of Little West 12th Street and 9th Avenue, the nearly 100,000-square-foot project for the retailer formerly known as Restoration Hardware, now known as RH, is within the stringently-protected Gansevoort Market Historic District. The building itself was constructed over a century ago as a retail warehouse, and ultimately transformed into a garage for the renowned Astor family. For project lead Jim Gillam, the constraints set by the Landmarks Preservation Commission pushed the design team to draw upon the neighborhood’s prevailing historical elements: the bolts, splices, and rivet patterns found on steel and cast-iron awnings, as well as elevated infrastructure. The new black aluminum frames primarily consist of a set of prefabricated components. Each frame is composed of two aluminum cross braces which are fitted to a set of turnbuckles, allowing for the adjustment of tension across the screen wall. T-frames studded with bolts are the primary vertical and horizontal elements of the screen wall. These can be split into two categories: structural members that run the length of the elevation and drive into the building below, and beams supporting the overall rigidity of the frame. This entire system is connected to an array of vertical mullions through existing steel brackets and a new screen wall connector. For the project, Backen & Gillam worked closely with the manufacturer, Ahlborn Structural Steel, to produce a kit of parts that was easy to assemble on site. Every component shipped from Santa Rosa, California, was designed as a three-piece unit set to maximize space on the convoy of flatbed trucks that carted them across the country. Each aspect of the screen wall, down to the bolts, were numbered and classified to ease their installation. In total, the design and construction teams were able to erect the entire addition in approximately two weeks. Gillam's interior spaces maintain the structure's historical bones while providing room to breathe for the new. The central and defining moment of the internal spaces is the light-filled, six-story atrium extending the full height of the complex, with successive rows of fluted Corinthian columns bordering aluminum-and-glass balconies. 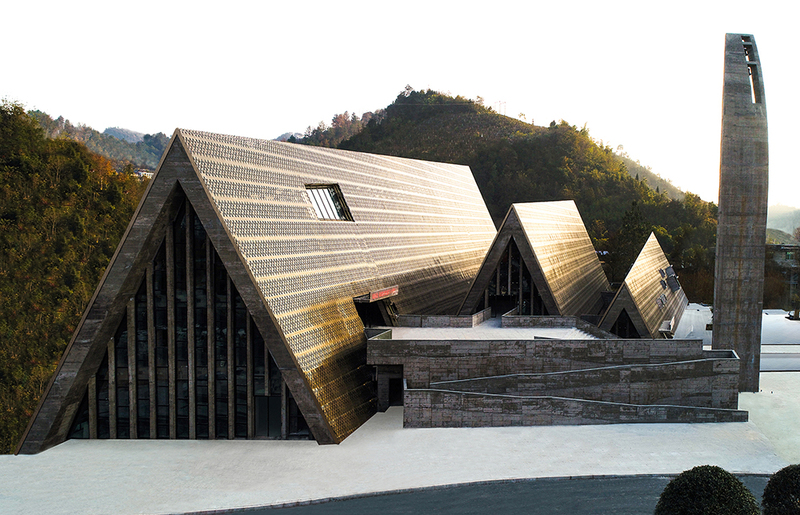 Opened to the public in December 2017, West-Line Studio’s Shui Cultural Center is an imposing complex located in a valley within China’s rugged Sandu Shui Autonomous County. 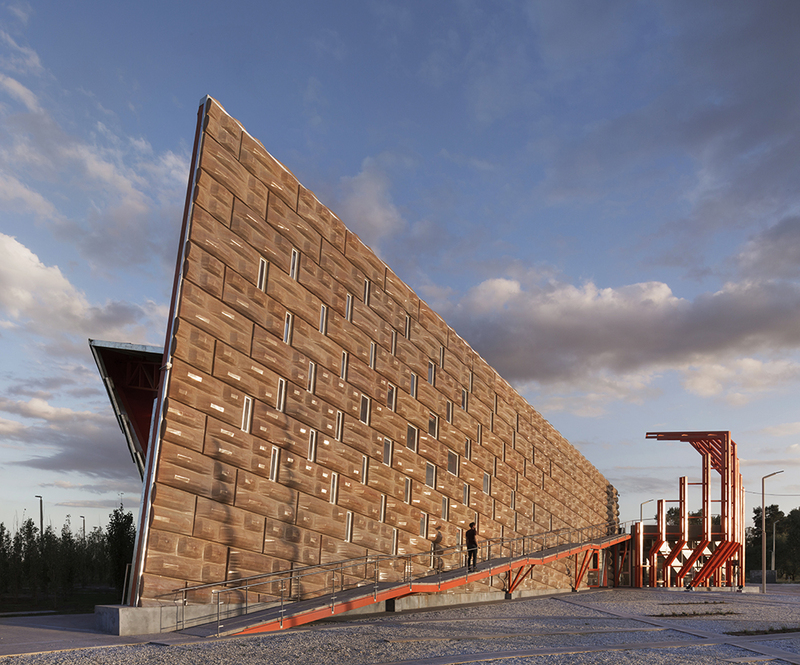 The complex, consisting of three single-gabled halls and a monumental tower, is a formidable display of timber-pressed concrete covered in pitched copper plates. Facade Manufacturer Changsha Di Kai Construction Engineering Co., Chongqing Zhongbo Energy Conservation Glass Co. The Shui people, concentrated in the county and the larger Guizhou province, are a distinct ethnic minority with a unique language and logographic writing system. For West-Line Studio, the project was an ambitious attempt to translate local customs into a cohesive design for a cultural center campus nearing 150,000 square feet. Placed atop an expansive concrete podium, the halls are of varying size, height, and function. 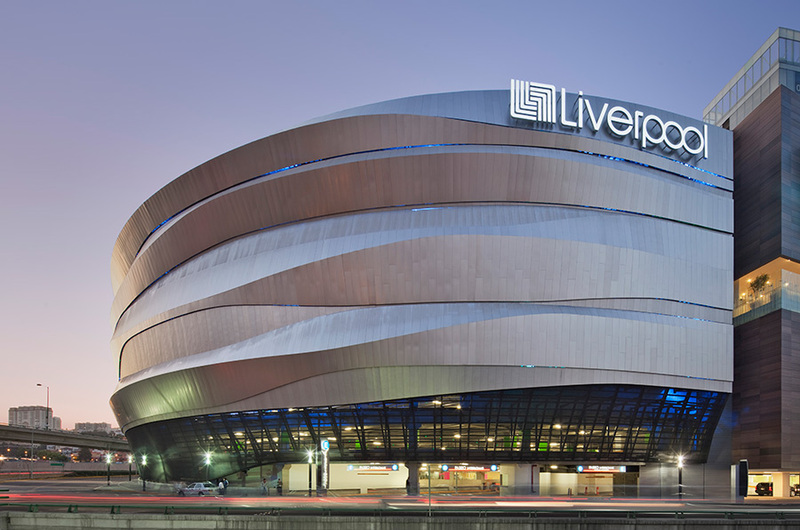 They are unified by relatively hidden wall openings and approximately 4,000 perforated copper cladding panels. Each half-inch-thick panel, measuring four by two feet, was subjected to a multi-stepped anodizing process to overcome corrosion in the acid rain–drenched province and to boost iridescence. The perforations, numbering just under 50,000 in total, fulfill three functions. Structurally, gaps in the copper plate significantly reduce the dead load placed on cantilevered concrete trusses and the screen wall fastening system, composed of galvanized steel corners, sheets, and expansion-and-burst bolts. Aesthetically, the perforations create a patterned brise-soleil for the halls’ east and west elevations, filtering light through the narrow, rectangular glass panes that line the hall. Symbolically, the gaps are a nod to the Shui character for rain, which consists of tiered vertical bands. The interiors of the complex, marked by exposed concrete structural systems, are imprinted by the surrounding landscape through the use of pine panel-formed concrete. Sandu, relatively isolated from the country’s principal economic centers, is known for its dense Huashan pine and Chinese fir forests. The concrete detail effectively softens what could be considered an ominous space, transforming them into grey, oversized versions of the region’s traditional timber vernacular forms. The triple-glazed glass panels, produced 350 miles north in the megalopolis of Chongqing, largely insulate and guard the complex from the elements. However, West-Line Studio inserted two details that add color and symbolic depth to the cultural center. In the complex's ritual hall, glass panels are dyed to resemble typical batik tapestry patterns, blanketing the concrete walls and flooring with ever-changing color. Additionally, box-like concrete appendages marked with traditional Shui logographic characters protrude from this same hall. With a glance of sunlight, the characters are beamed downward, further tying the symbolic and material. Correction: An earlier version of this article incorrectly identified the cladding panels as being made of bronze rather than copper.